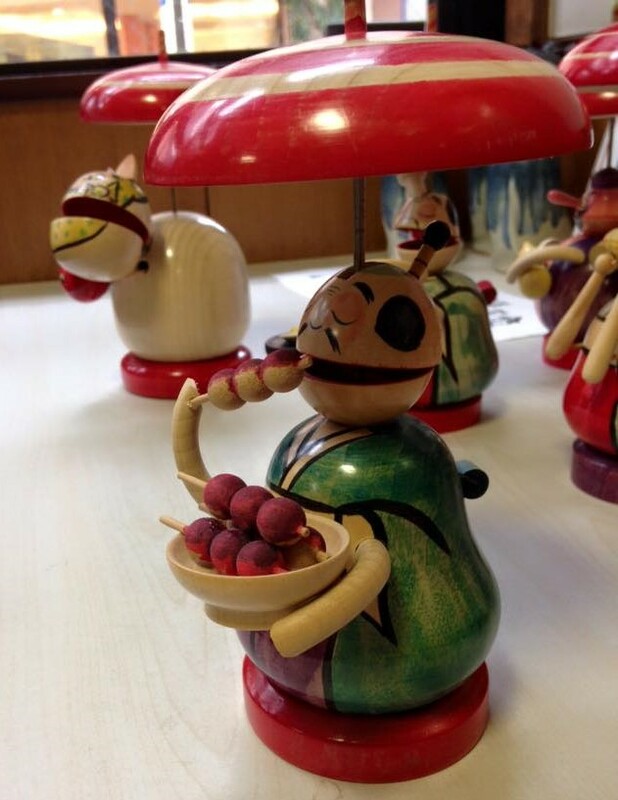 An automaton top of a man eating dango, by Hiroi Masaaki. 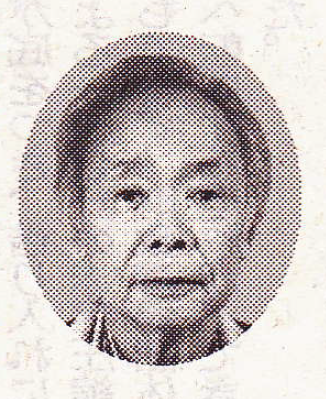 In addition to Hiroi-sensei, his brother, Hiroi Masaaki, has also appeared in newspapers as a well-known Edo top maker. Below is a translation of an article entitled “Edogoma Spin Around the World” that ran December 31, 2007 in the newspaper Nihon keizai shinbun. See the original Japanese article at the link below. It has been over 60 years since I began creating Edo tops. My ancestor was a low-ranking court doctor in charge of the emperor’s health, but he, my great-grandfather, made his livelihood out of his hobby of making tops. I am a fourth-generation top-maker. Supposedly during the bakumatsu, the end of the Edo period, when Japan was divided into imperial loyalists and shogunate supporters, my great-grandfather and grandfather took up their swords. I was born into a top-making family, and I think that [the reason] we continued to be poor was that my relatives always fought, like everyone in that period of time. What a pain it was. There are many kinds of tops, but Edo tops have a particular way of spinning, and there are also those that are automatons, coming to life as they spin. I don’t create just traditional forms [of tops] but also come up with new technical forms. I haven’t counted them, but I’ve probably invented around 4,000 or 5,000 types. I was born in 1935. I lived in Oshima, Kōtō Ward (Tokyo) with my mother, father, and three siblings. However, in 1945, my mother and two of my siblings were killed in massive air raids. We were driven out of our home by the fires from air raids, first to Kuramae, then Roppongi and Shirokane, one after another, and barely escaped with our lives. It was also because of the war that I began to make tops. My friends were all evacuated outside of the city and I had no one to spend time with. One day, my father gave me a foot-powered lathe so I could make tops and other things to play with. I liked working with my hands, so every day I worked on the lathe. After the war, at the invitation of a toy wholesaler in Kuramae, my family moved to Shiroishi in Miyagi prefecture. In Tōhoku we were able to obtain good-quality lumber. However, because my father had lost his wife and children, his heart wasn’t in his work. So my older brother and I made tops and kendama (cup and ball toys) and sold them on the Sendai black market. It was a time when there were no toys, so they sold quite well. I finally returned to my hometown of Tokyo at the end of my 20s. I did demonstration sales, and during this time I began to make tops while earning a living . There was a traditional arts boom at the time, which popularized Edo tops, but the production wasn’t valued at all. However, I did find working out automaton devices interesting, so I diligently produced various tops even if they didn’t sell. 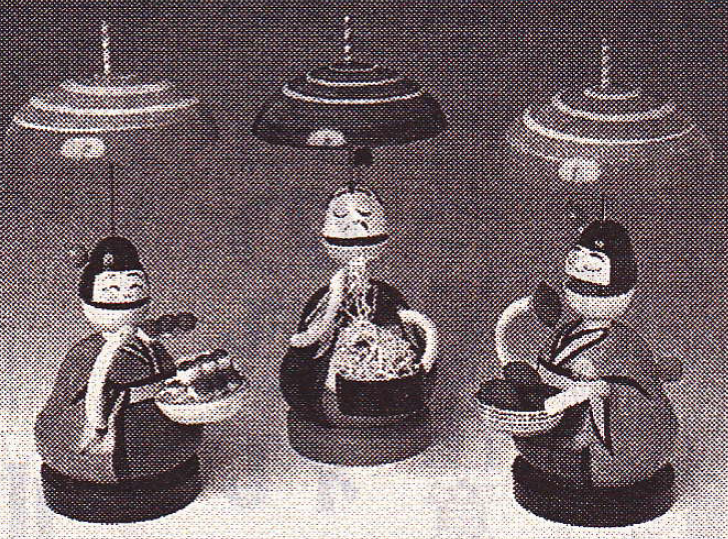 There are also automaton tops where when you spin the top of the head, the dolls eat soba or sweet potatoes. There are no diagrams for top-making. For example, a sakadachi (“headstand”) top flips upside down while it spins, beginning to stand on its handle. When I made that, I only had the knowledge of experience that centrifugal force will make the heavy portion will face upward. After that, one makes the shape through trial and error. Brilliant people overseas seemed to understand the mathematical reasoning behind the tops flipping on their heads, but because they’re tops, they have to spin. When I come up with an idea for an automaton, I don’t ever give up until it’s been realized. There’s one top, “Momotarō” (Momotarō the Peach Boy)—when you pull the string and make it spin, the peach part is supposed to pop open so you can see the little boy— but the peach’s mechanism doesn’t open properly. I thought about it for days on end. I made an adjustment to the placement of the elastic, and when the peach popped open smoothly a bell went off somewhere. It was New Year’s Eve of 1965. Perhaps because I gave a dubious expression at that, he said the following: “While it’s important to pass along tradition, there’s no meaning in contemporary artists recreating, say, Greek sculptures exactly the same way they were 3000 years ago. Rather, there is value in contemporary artists creating new art.” That I am able to proudly say today that I am producing tops that are my own work is because of his words to me. From then on, I was invited to share Japanese culture with people overseas and traveled around the world, taking my tops with me. I’ve probably been to about fifty countries by now. I think of tops as toys but to people in other countries they’re seen as art. From the perspective of a craftsman, shaking hands [with such a person] is somehow embarrassing. When this article is published on New Year’s, surely I’ll be in my studio turning the lathe. For complicated mechanisms, sometimes it can take as many as 10 days to produce them. Even though I’ve been on this path for 60 years, that’s nothing to boast about. If one cannot do their craft skillfully, that is nothing but failure. The idea that tomorrow I will be able to make even better tops tomorrow than I did today—that is what has kept me going for such a long time. A top that’s well-done has a vertical handle that stands up straight and doesn’t wobble in the slightest when it turns. When it [spins so well] that the top appears perfectly still while spinning, I call this “sleeping.” When I look at a “sleeping”” top, the words someone once said to me come to mind: “There is a top in our hearts. If the axis doesn’t wobble, your life is on the right track.” On New Year’s Day, I’d like to examine my own heart’s top as I see children playing with theirs.